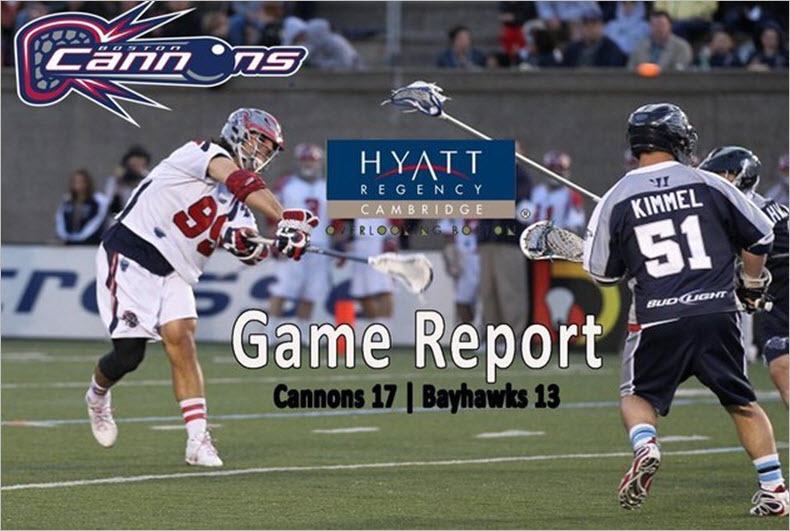 Cannons Prevail Over Bayhawks, 17-13 - Tomahawks bring 325 Players and Parents to the game! BOSTON, MA - Saturday, June 04, 2011: In front of a record-breaking crowd of 10,727 fans, the Boston Cannons improve to 2-1 on the season with the 17-13 win against the Chesapeake Bayhawks (2-1) at Harvard Stadium. Paul Rabil earned the Bud Light MLL Player of the Game with five goals and two assists, while Matt Smalley, Jason Duboe and Jim Connelly each scored their first MLL career goals. starting Defenseman Mitch Belisle (#85) and starting Attackman Max Quinzani (#88). After some more desserts, including a birthday cake, we marched the boys onto the field to create the tunnel where the Cannons enter the field. We then got to watch two of our own players battle in the Stockyard Challenge, where Ric and Ryan had to spin around a stick 10 times and then try to shoot and score three goals. They did great! For the Cannons, Boston started off hot with a quick a goal from Pat Heim within the first 30 seconds of the game. Greg Downing followed immediately with a shot past Bayhawks Goalie Chris Garrity, giving Boston the 2-0 lead. Chesapeake answered back half way through the first quarter with a pair of goals to tie the game. Brad Ross scored just inside the two point arc with an assist from Rabil to give the Cannons what looked like a lead into the second quarter. But Matt Abbott was able to find the back of the net with seconds left, ending the first quarter in a 3-3 tie. The Cannons baffled the Bayhawks defenders to begin the second quarter with five unanswered goals from Smalley, Rabil, Ross,Max Quinzani and Duboe, bringing the score to 8-3. Chesapeake's Michael Kimmel was able to shine some light on the Bayhawks offense with an unassisted goal, but Rabil fired the ball into the back of the net once again bringing the Boston lead back to four. Chesapeake was able to end the half with a last-second two-point goal from Steven Brooks, leaving the score 9-6 going into the break. The Bayhawks continued their comeback with the first goal of the third quarter from Ben Rubeor. Chesapeake's run was short lived, however, as Rabil scored back to back goals, extending the Cannons lead to 11-8. Boston increased their lead to five with the score standing at 13-9 going into the last quarter. The fourth quarter remained action packed with both teams scoring four goals apiece. Quinzani found the goal early in the fourth before the Bayhawks were able to keep it close with two goals to pull within three. But Quinzani completed his hat trick, along with three assists in the game, while Rabil scored his fifth goal to end the game at 17-13. The Boston Cannons return to Harvard Stadium on Saturday June 11that 6 pm to face the Long Island Lizards for the second time this season. For more information or to purchase Cannons tickets, visit BostonCannons.com or call (617) 746-9933. This year our program will be going to our Eighth Annual Northborough-Southborough Night at the Cannons. Come on out for a great family fun night and support your hometown professional lacrosse team. We have set a new record - 325 Parents and players attending this year from our program! We have now had 2,006 attendees altogether participate in the 8 Cannons nights we have done! We feel this is one of the truly great evenings of family fun and sports entertainment. The Boston Cannons are the equivalent to the Red Sox or Patriots. You wll see the very best lacrosse players in the world compete. 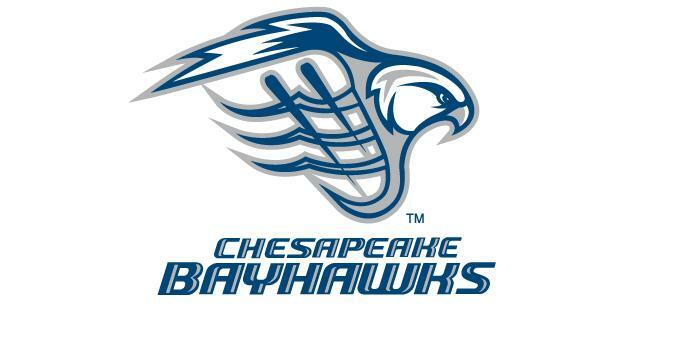 Saturday June 4th the Cannons host the defending Champion Chesapeake Bayhawks. Because of the large number of U11 players we have this year, we chose to have a full game prior to the Cannons game. We will plan an afternoon tailgate party with our program, followed by a game of our U11 kids (combining all U11 players). 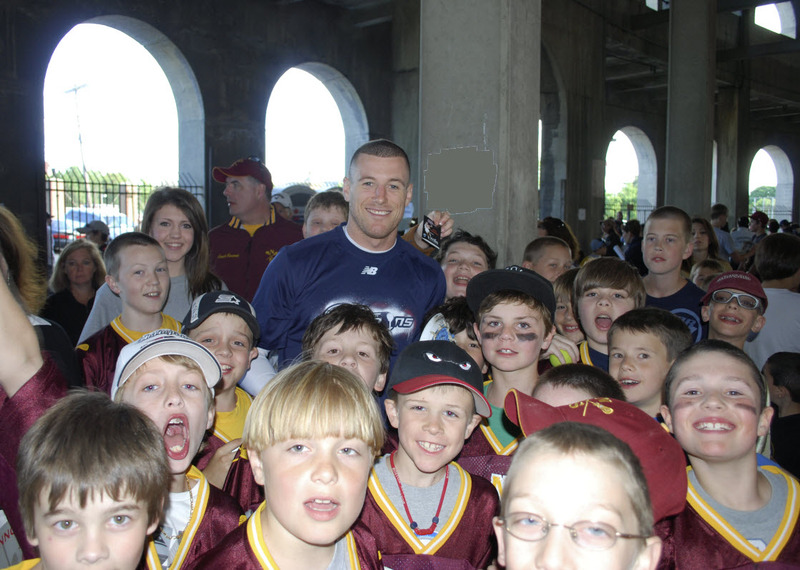 The boys will then have a private Meet and Greet with a Cannons Player to get autographs. Just prior to the start of the game the boys will also get to form the tunnel through which the players run when they get introduced. Our Meet & Greet for Northborough-Southborough will be announced soon.